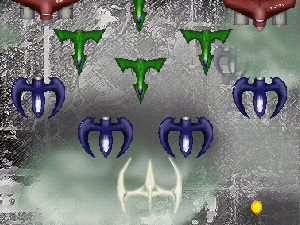 Shoot enemies of the same colour to form a chain. Detonate chains to earn points. The bigger the chain the bigger the score bonus. Shoot every ship of the same colour once, then press Shift to blow them all up good. As you progress, the ships attack in greater numbers and in stranger patterns. Prepare to meet... the BOSS (a very brief encounter). No Install! Just play online! To play offline, download then unzip and run "TriShade_Aduro.exe". You can shoot while you're dying. Hence, you can always avenge your death. If this is a bug, don't fix it! While this game has a deluxe soundtrack, and some amazing graphical effects (check out those background planes and clouds), the best part is the risk/reward game mechanic the team found time to perfect. I can't stop myself from chaining the ships together, despite the fact it's not always the smartest thing to do. 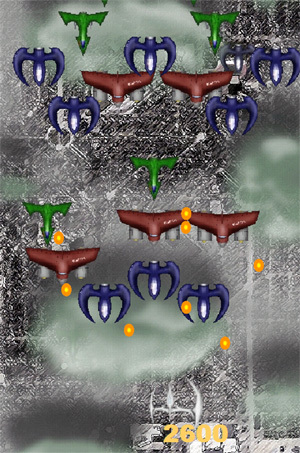 The enemy attack formations test your puzzle skills more than your reflexes, which is oddly addictive. Definitely one of the most "complete" games created at TOJam #2.